It’s an unfortunate fact that I was born lacking the green thumb gene. My grandma had a beautiful garden full of flowers, fruit and macadamia nut trees, and a huge, grassy lawn. The centerpiece of our yard was a Surinam cherry tree so large you could climb up in it, whereas most times I see it around town as a bush or shrub. She had that touch. I, on the other hand, do not. One of the items in my 30 before 30 list was “Find a plant I can’t kill,” and I successfully grew a succulent for months until I forgot it out on the lanai for awhile and it shriveled up, all brown and sad. I had a potted cherry tomato plant that yielded maybe 10 juicy little fruit before succumbing to some sort of rot. And this year, I picked “Grow” as my word for 2013. I got a hanging plant with cheerful blue flowers to put outside my door, in December. You guessed it, dead by February. So while I don’t always trust myself to keep a plant alive, I really really admire those who can! Enter my new obsession: Paiko. 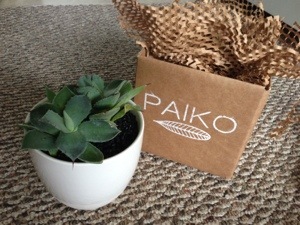 The girls at Paiko have hand-picked a selection of flowers, succulents, air plants, and terrariums and will happily advise you on what grows best where, what’s easiest to care for, and tips to keep your plants happy and… alive. Their concept is about creating art from nature, which shows when you walk through their beautiful little space – you’ll even see vases for cut flowers and living staghorn ferns mounted on the wall. I love stopping in to pick up gifts for friends (like the cute little agave plant shown above) but haven’t yet taken the plunge into getting one for myself after the hanging plant disaster. Bonus: they’re just a couple doors down from Taste, with a rotating lineup of vendors (like Cocina Hawaii) and around the corner from The Whole Ox. Two birds, one stone… Yet another reason to venture into Kakaako.